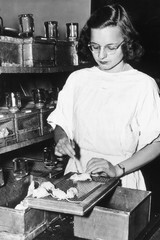 Virginia March (no additional information about her) painting mouse with hydrocarbons to induce tumors at the McArdle Laboratory for Cancer Research. The laboratory was established by private citizens in 1940 as one of the first basic cancer research facilities in the world. G. Terry Sharrer. National Museum Of American History.